You will never complain about leftover turkey again. Who all has leftover turkey still lurking in the refrigerator? Don't all put your hands up at once. Here’s a recipe to pull out up to a week after any holiday that leaves you stuck with an overabundance of turkey. This is also a recipe that uses mostly ingredients that you already have. All I had to purchase was a head of celery. Before the biscuits are added on top. This dish takes 4 cups of cubed turkey. That’s the equivalent of about one turkey breast. It certainly doesn’t have to be all white meat. I’m actually a fan of the thigh and leg more than the breast. So my mixture was a combination. The secret to the flavour of this “pot pie” is in sautéing the aromatic vegetables. Many recipes call for boiling, which does nothing for their natural sugars. The browning adds depth that you may not expect. This recipe is really good. It’s filling, delicious and homey – a classic comfort food. No one will ever turn their nose up at leftovers again when this hits the table. In fact, you may even be asked to prepare turkey specially for this. I really meant it. 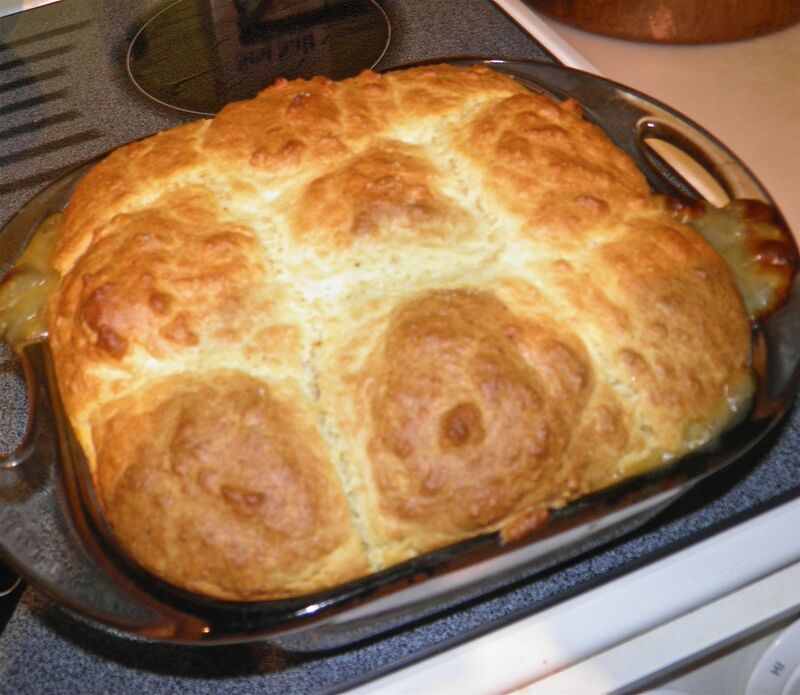 The recipe calls for processed cheese in the biscuits. Many times cheese biscuits will call for cheddar or a similar cheese. I had made processed cheese (very easy) and still had some left over. So that’s why it went in. As long as the cheese you use isn’t a hard variety and is able to be cubed you will be fine. Experiment with Swiss, or monterey jack or even mozzarella. I found the mildness of the processed went well with the turkey. Of course you can substitute chicken for the turkey if desired. I find turkey has much more flavour than chicken. It probably has to do with the fact that most chickens are grown so quickly they have no chance to develop natural flavour. If you use a free-range or small-farm chicken you may not find that to be the case. This recipe was exceptionally good. It really hit the spot. It also gave me the opportunity to get rid of the last of my leftover turkey! 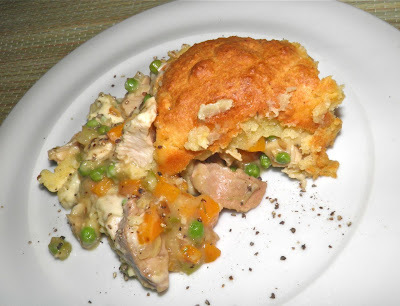 If you've been turned off by pot pies from your past you should give this one a try. I have a funny feeling you won’t have the same opinion of them again. Souring the milk with vinegar is a substitute for buttermilk. keeps working longer, as it bakes. Cube the turkey and set aside. Dice the carrot, onion and celery. Place the milk (from the biscuits recipe) in a bowl, add the vinegar, stir and set aside. as important a role. They were tasty. Melt the butter in a large pan. Add the carrot, onion and celery and sauté until the vegetables soften and start to brown slightly, about 5 minutes. Sprinkle with the flour and mix well. Add the chicken stock and stir until thickened, about 2 minutes. Then add the thyme, cubed turkey, pepper and salt. Taste for seasonings and adjust if desired. Stir in the frozen peas and set aside. To make the biscuits, combine the flour, baking powder, baking soda, salt and pepper in a food processor. Pulse to mix. With the motor running, add the butter and cheese piece by piece and mix until both are chopped well. Then slowly add in the milk, scraping down the sides as necessary. Do not over-mix. It should be moist but not a purée. 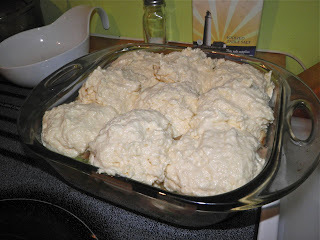 You will see that the batter begins to “puff” as soon as the vinegar/milk is added. This is normal and just what you want to happen. 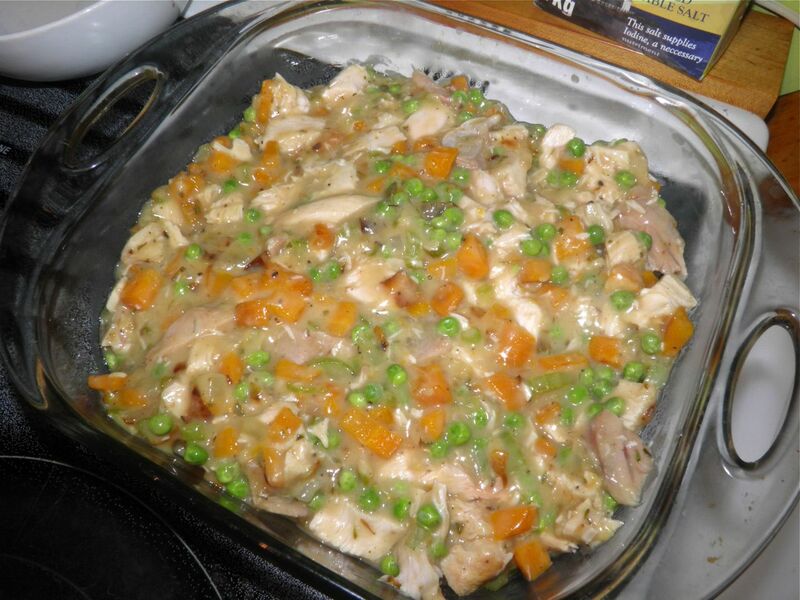 Place the turkey mixture in an 8”x8” deep baking dish (or 9” x 9”). Drop the biscuit mix on top by very heaping tablespoons. Leave room between the biscuits if possible. Place a cookie tray on the rack directly under the turkey, just to be on the safe side. Bake in the centre of the oven for 35 minutes (or 40). The biscuits will be browned on top and the turkey mixture will be bubbly. Remove from the oven, Let cool for just a minute or two and then serve.